Mundial Scissors and Shears are made from high quality Alloy Steel! Mundial Scissors and Shears are guaranteed for life. These Mundial scissors and shears are used by quilters, tailors and hair stylists around the world! We stock the complete line of Mundial scissors and shears at the low prices! Check it out ...Electric Scissor Sharpeners! For Scissor Storage Idea's Click Here! Quantity Discounts are Available, Please Email Us! More Scissor & Shears - Click Here! These are Mundial Cushion Soft Dressmaker Shears! They have blue handles with cushion soft finger linings and razor sharp alloy steel blades. These ambidextrous scissors are quite comfortable and easy to use. Chefs Note: These 8 1/2 in. Dressmaker Shears are good for fabric and general use. This is our favorite out of all multi-purpose scissors that we have tested. These are excellent Hobby and Craft scissors. They have soft rubber lined blue handles and very sharp alloy steel blades. 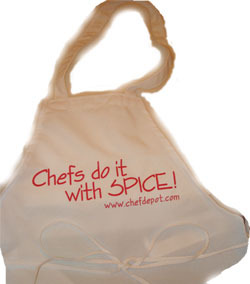 Chefs Note: They are perfect for right or left hand use and quite comfortable. Perfect for all your hobbies and crafts. We know you will like these! Click Here - Electric Knife & Scissor Sharpeners! These are excellent hair cutting scissors. They have comfortable handles with finger control rest and very sharp micro serrated alloy steel blades. Chefs Note: They are perfect for right or left hand use and quite comfortable. A Perfect choice for barbers and stylists. We guarantee you will like these! Update Your Kitchen! Click Here - Chef Designed Center Islands! Wahl PowerDrive clipper Built-in trimmer, Blade guard, Durable storage case, Blade Oil, Cleaning brush, Pro Scissors, Styling comb, Barber comb, Ten Guide Combs: 1/8" (3mm), 1/4" (6mm), 3/8" (10mm), 1/2" (13mm), 5/8" (16mm), 3/4" (19mm), 7/8" (22mm), 1" (25mm)Left ear taper, Right ear taper, English & Spanish instructions/styling guide, come with a 5 year Warranty! Made in the USA. Our barbers and sylists use this set. We tested it out and it's a snap to use. Click Here for Kitchen Supplies! Click the links below for more Scissors! These are the Poultry and Fish Shears that we use in the kitchen! They are manufactured in Brasil to our specifications from a special alloy stainless steel to a Rockwell Hardness of 54/55. The shears pictured are excellent for trimming poultry, fish and many other foods. We use them to cut through bone, fins and feathers. A favorite for Crappie and Walleye, Chicken Wings and Ducks! Chefs Note: These Poultry & Fish Shears are 10 inch long and have a safety lock on the back of the handle. Very good quality with a Lifetime Warranty. These Elegance Kitchen Shears make cutting and trimming a snap. They come apart into two pieces, very easily to allow for easy cleaning! Chefs Note: These shears are excellent to keep in the kitchen for cutting fish, chicken, pastry, paper, carpeting and cardboard. Lifetime Warranty. These shears are amazing! The new Messermesiter 2 pc. 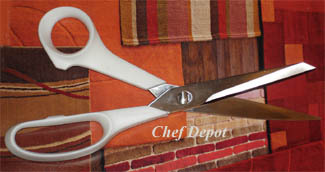 offset Shears are rated #1 by several gourmet magazines. Functions include a screw driver, nut cracker, jar lid opener and gripper, bottle opener, bone and twig cutter! Great for cutting fish, carpeting ar anything in between! From the finest thread to the thickest cloths, for grooming, sewing or food preparation. There is a task for every scissor and with Messermeister, a scissor for every task. Chef Notes: The two piece take apart feature makes these easy to clean. 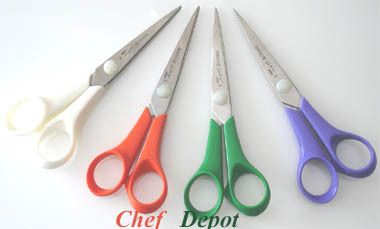 Great Quality Offset Shears! Lifetime Warranty! Hot Sale! Diamond Sharpening Steels! These are Mundial Forged Shears! They are razor sharp, made to last and quite comfortable to use. These shears are 8 in. overall length with a free safety guard! Many other sizes are available, incl. left handed scissors and other forged pairs (click on page 7 link below). Large quantity discounts! 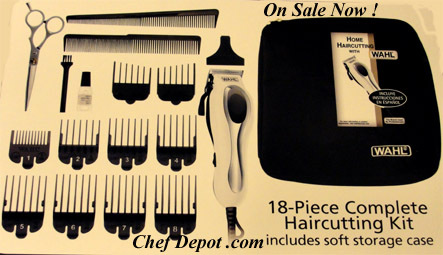 New Chef Supplies for your kitchen! These are Mundial Serra Sharp Forged Shears! They are razor sharp, made to last and quite comfortable to use. There are many manufacturers and upholsterers using these beauties to cut kevlar, leather, vinyl and other tough fabrics! These shears are 7 in. overall length. Other sizes are available and we offer large quantity discounts! These shears are 8 in. overall length. Other sizes are available and we offer large quantity discounts! Click Here for More German Chef Cutlery! Click Here for Chefs Cutting Boards! These are Mundial Multi Purpose 2 pc. Take Apart Shears, now with black handles! They are razor sharp, made to last and quite comfortable to use. These easily cut through most tough stuff. Two piece take apart. These shears are 8.5 in. overall length with 5 in. blades! Lifetime Warranty. Hurry, at this price these will sell out fast! Messermesiter 2 pc. 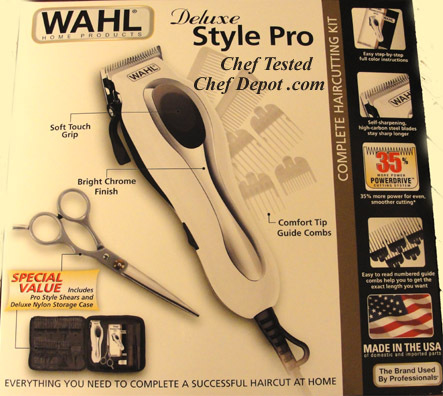 Shears are rated #1 by several gourmet magazines. Functions include a screw driver, nut cracker, jar lid opener and gripper, bottle opener, bone and twig cutter. It separates for hygienic cleaning, and dishwasher safe! From pie crusts to poultry. Great for cutting carpeting or anything in between! From the finest thread to the thickest cloths, for grooming, sewing or food preparation. 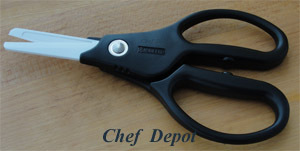 Chef Notes: Great Quality Shears! What a deal. The two piece take apart feature makes these easy to clean. Lifetime Warranty!